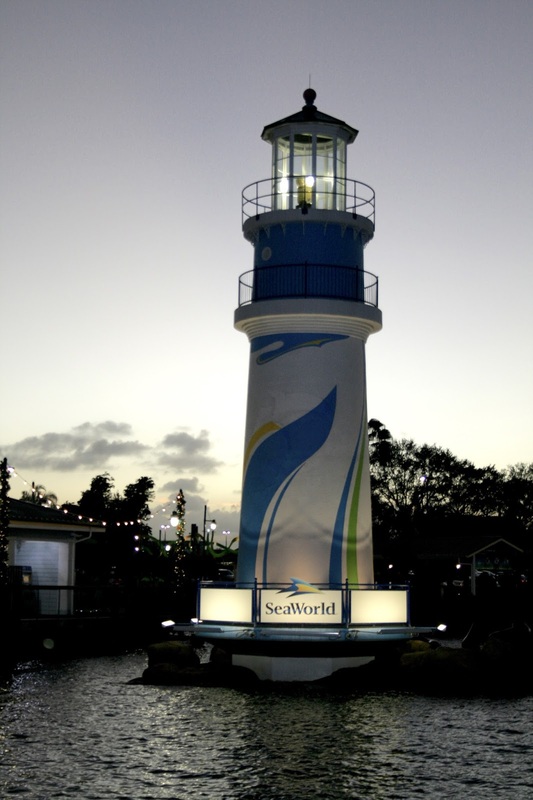 Amy's Creative Pursuits: Our Visit to Sea World! 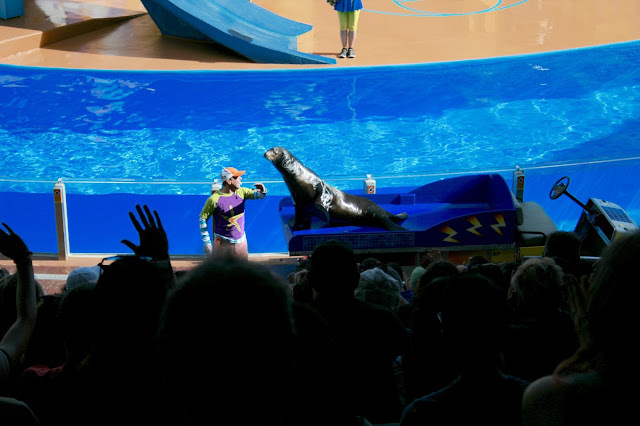 Many visitors to Orlando visit the Disney theme parks or Universal Studios, but there is also another theme park in the area and that is Sea World! 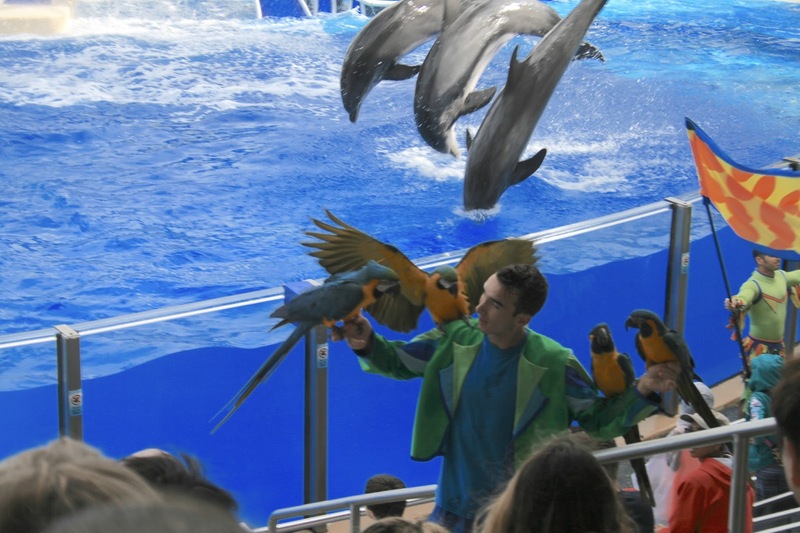 A lot of people who visit Disney World and then go to Sea World state that their kids enjoyed Sea World more because it is less crowded and they enjoyed the interaction with live animals. I know Sea World was my children's favorite park when we first visited years ago. When we were in Florida this past November we had the opportunity to go back to Sea World because we received some free tickets from my husband's uncle. It was really fun to see what had changed and what remained the same. One thing we did this time that we didn't do the last time was see the dolphin show. Oh my, do those dolphins love to show off for the crowd! It was such a fun, exciting show and we loved the ending when large parrots flew over our heads! When I see these shows I never know who I'm more amazed with; the animals or the trainers. The physical skills of theses trainers is mind-blowing! In addition to regular dolphins, they also had these beautiful black dolphins in the show. and penguins! All the animal exhibits are highly educational. One of our favorite exhibits was "Antartica: Empire of the Penguin". This exhibit is actually a cute ride that you go on where you see the South Pole through the eyes of little penguin named "Puck". When the ride ends you explore the penguins colony. Be warned though: it's FREEZING inside! Another show we went to was the sea lion show. I must admit, we didn't care for this show. The first time we saw it years ago it had a pirate storyline and was absolutely FANTASTIC. But they have since changed the show to a high-school theme, and it just did not work. It was not as funny or as entertaining as the previous show. Although when this giant walrus crawled out from behind the curtain at the end of the show, I think everyone's jaws dropped. He was so huge! Sea World is also filled with a lot of aquariums. We loved watching this giant walrus swim under the water. And you could also see what life inside an aquarium is like for yourself! 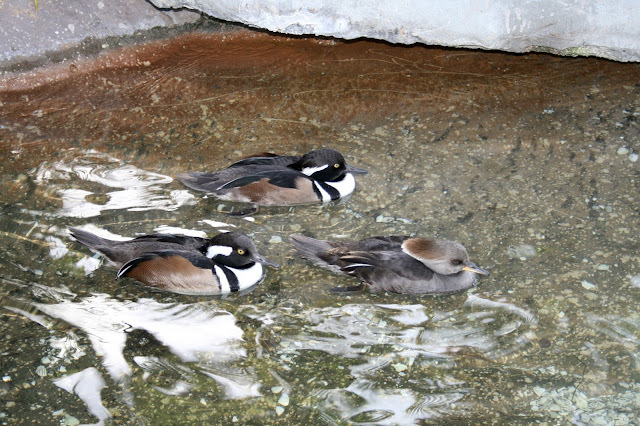 Water birds are everywhere in this park: both captive and free! 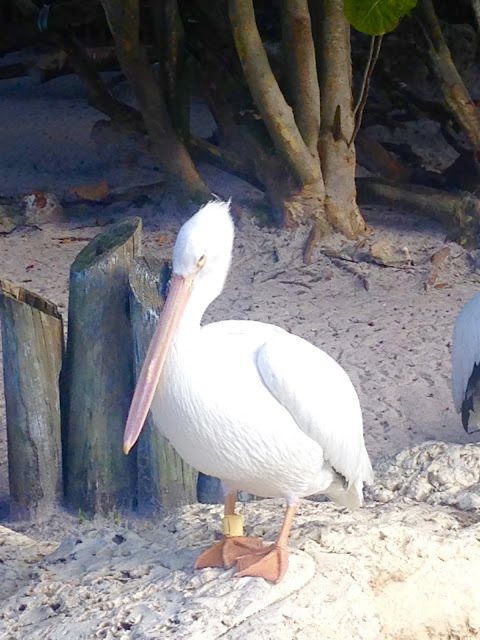 Birds from all over Florida love to make Sea World their home. During all the shows we saw free cranes fly in hoping to snag a fish from a trainer. 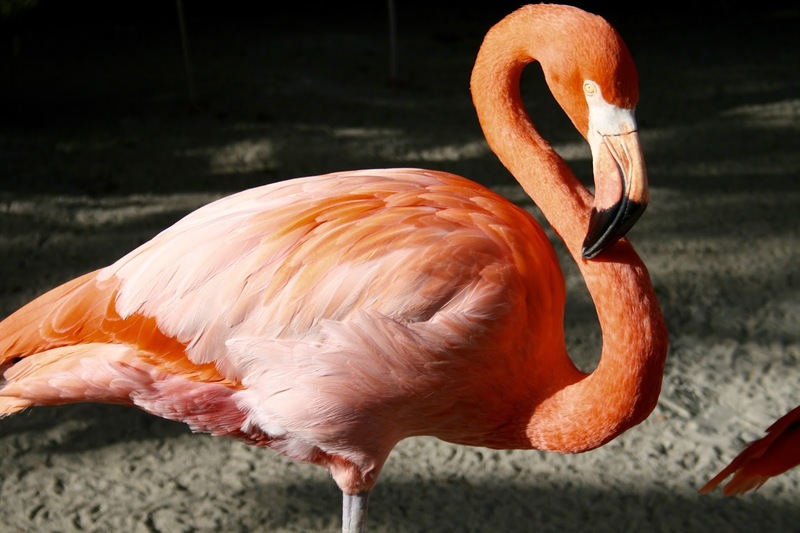 Flamingoes are one of my favorite birds. I have no idea what these are, but I love the swish of white feathers by his eyes. And here are two free birds we found just walking on the sidewalk! Could this little guy be any cuter? This is a picture from the dolphin nursery where they keep the baby dolphins. Here is where you get to rub their bellies and get up close and personal. I loved how this little guy jumped out of the water to get a peek at us. 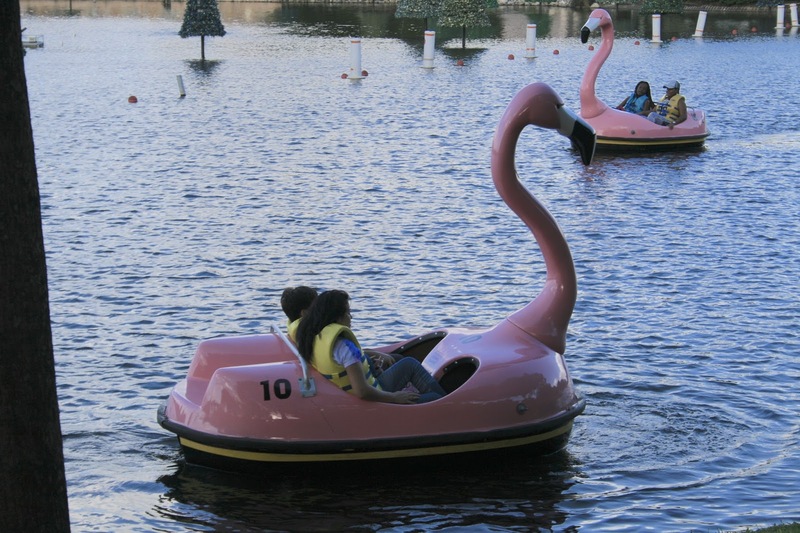 There is more than animals and shows at Sea World, they also have a few rides like this paddle boat on the lake. A tall tower ride that gives amazing views of the park. And this water ride called "A Journey to Atlantis". There are also a few roller coaster rides, rides that involve movies and a few rides for kids. They even have a huge play area for the little kids called Shamu's Happy Harper which include kiddie rides and a net climb. The last thing we did before we left the park was attend the killer whale show "One Ocean". It was the perfect way to end the day because this show was unbelievable. These whales were so well-trained and performed to perfection. It was a fabulous show. Before I conclude my post, I'd like to share my thoughts on Sea World since I know its controversial subject right now. There are a lot of people who believe zoos and places like Sea World should be banned, because they think animals should be freed and shouldn't be a source of entertainment for humans. I certainly understand why they feel way, but here is my perspective. All the animals in Sea World are either born in captivity or they are rescue animals; meaning they were injured animals that could not survive in the wild and now call Sea World home. In my entire day at Sea World, all the animals seemed well cared for, loved, and happy to me. Almost every show and ride was educational, especially the killer whale show. Without zoos and places like Sea World to teach us about animals, and how to love and care for them and our planet, where would be? I think we would be very ignorant and end up hurting more animals and our planet. I look at other countries where exotic animals are hunted for their tusks or skins and they don't care if the animal is going extinct, they just want the money. This is ignorance. These are uneducated people who don't understand what they are doing is destructive to our planet. If we can educate our children about animals through zoos and theme parks, and teach them how to care for animals and the environment and have fun at the same time, I think it's a great thing. I think it would be relaly cool to see Sea World!! Looks like you all had a fun time. That little dolphin looks so cute! Some great photos, Amy! Despite what everyone says about Seaworld, I think they are doing a lot for conservation, educating the younger generation about the fragility for our environment and generally getting people interested in animal welfare. 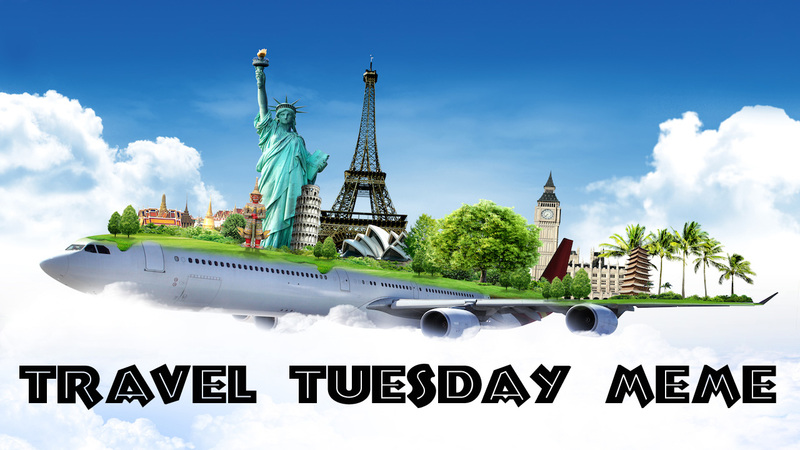 Many thanks for participating in the Travel Tuesday meme, don;t forget to link up again this week!